Raaga.com: BAJIRAO MASTANI losses the first round of the battle to DILWALE! 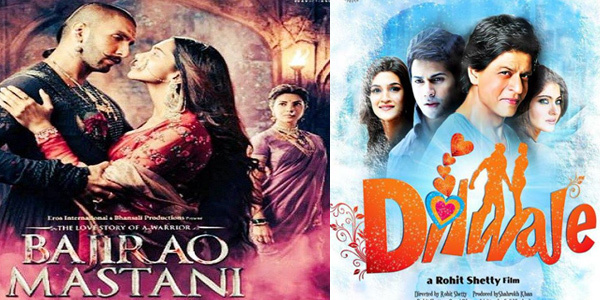 BAJIRAO MASTANI losses the first round of the battle to DILWALE! Eight years ago in 2007 celebrated filmmaker Sanjay Leela Bhansali lost battle to Superstar Shah Rukh Khan when his much awaited film SAAWARIYA, which introducing Ranbir Kapoor and Sonam Kapoor and also had the superstar Salman Khan, in a pivotal role failed miserable opposite Shah Rukh Khan STARRER OM SHANTI OM! Cut to 2015; Once again the two distinguished film celebrities are at loggerheads with Sanjay Leela Bhansali’s historic drama BAJIRAO MASTANI clashing on the same day i.e December 18 with Shah Rukh Khan’s film romantic film DILWALE! Call it destiny or sheer ‘Charisma’ of Badshah Khan aka Shah Rukh Khan, even as both the film releases today Sanjay Leela Bhansali’s BAJIRAO MASTANI has already lost the first round of battle to Shah Rukh Khan’s DILWALE! Confused? Since the box office result are to yet pour in? Well, soon the box office reports will also reveal the true picture but let’s understand how BAJIRAO MASTANI has lost in the first round of battle to DILWALE! According to reports Eros International, the film distribution company which released Salman Khan’s mega hit film BAJRANGI BHAIJAAN this Eid was trying to bully Single Screen theatres owners by pressurizing them to only showcase his film BAJIRAO MASTANI. However the Single Screen theatres owners, who are aware that the audience would first rush to all cinema halls screening their favorite superstar Shah Rukh Khan were annoyed at the monopoly of Eros International hence they approached the Bombay Sessions Court on Thursday. Interestingly the Sessions Court gave judgment in favor of the Single Screen theatres owners and said that the theatre owners are free to screen any movie that they wish to. Thus bringing smile on the faces of Single Screen theatres owners and Shah Rukh Khan as now his film DILWALE will rule not just in Multiplexes but at Single Screen theatres. It may be noted that in comparison to Multiplexes India has several times more Single Screen theatres. Besides Rohit Shetty’s movies are usually targeted at mass audience that throngs Single Screen theatres. Hence it is beyond doubt that Shah Rukh Khan’s DILWALE will have a cakewalk, particularly on day one and if the film lives up to the taste of the audience than it will be a runway hit. In contrast Sanjay Leela Bhansali BAJIRAO MASTANI will have a slow start but may gradually intensify if the content is interesting!